NIPS4B contains invited talks, poster sessions for the presentation of accepted papers, panel discussions, and two challenges. This Bird NIPS4B competition asks participants to identify which of 87 sound classes of birds and their ecosystem are present into 1 000 continuous wild recordings (from different places in Provence France - nearly 2 hours of recordings, frequency sample = 44.1 kHz, SM2 system). The data is provided by the BIOTOPE society (having the largest collection of wild recordings of birds in Europe). The training set matches the test set conditions. This challenge is a more complex task than our previous one at ICML4B challenge for which 77 teams participated - see proceedings at sabiod.org. This enhanced challenge opens the 2nd of october. The metrics is the Area Under the Curve, as for our previous previous challenge. 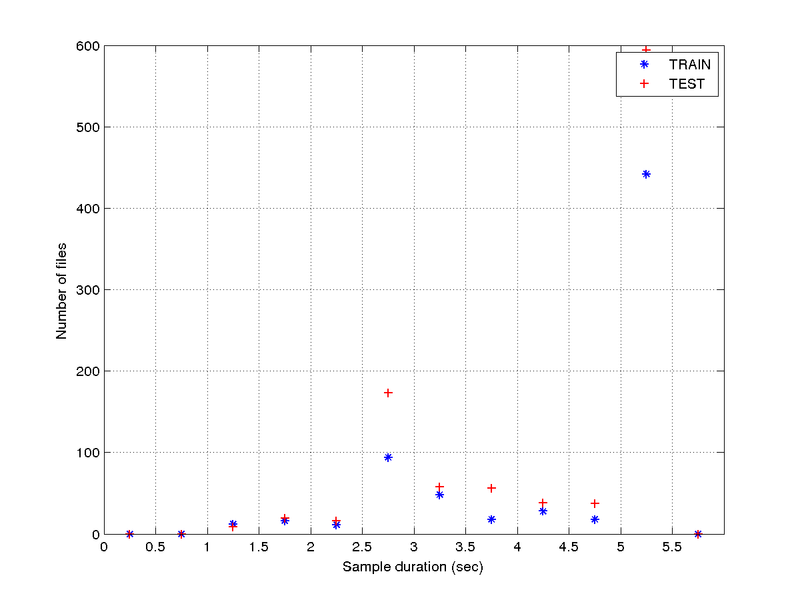 2/ SUGGESTED FEATURES: we provide baseline features of these train and test .wav files, computing optimized MFCC for bird's sound representation, as distributed in ICML4B 2013 bird challenge : MEL FILTER CEPSTRA COEFFICIENTS (MFCC) of WHOLE TRAIN and TEST FILES (158 Mo) The format is a matrix 17xN: 17 cepstral coefficients x N frames, frame size 11.6 ms, frame shift 3.9 ms, one line per frame. You may compute their speed and acceleration by simple line differences. These suggested features minimize the signal reconstruction error in average on bird species. The script which produced these MFCC is: MFCC SCRIPT for BIRD SOUND REPRESENTATION, as defined in ( Dufour et al. ICML4B.pdf & .bib) in ICML4B2013 proceedings (please cite if you use these features). 3/ LABELS: Here are the tables of the 87 classes to learn (.csv, xls, html). ** This archive also includes the TRAINING LABELS of the 687 train files (.csv, xls, html). For some species we discriminate the song to the call (and to the drum). We also include some species living within with these birds: 7 insects and a batracian. Each of these 87 classes in this table are to be predicted in the 1000 test files. Some training files are empty (background noise only called 'empty class') to tune your model, this class is not to be predicted. The training set contains 687 files. Each species is represented by nearly 10 training files (within various context / other species). 5/ RULES: we follow the usual challenge rules (like Kaggle). Your classification system must be completely automatic, and must only use the provided .wav files (no external information are allowed). You cannot sign up from multiple accounts and therefore you cannot submit from multiple accounts. The competition host have the right to publicly disseminate any entries or models. Winning solutions need to be made available under a popular OSI-approved license in order to be eligible for recognition and prize. Winning solutions must be posted or linked to competition organizers. Prizes will be awarded after the winners have posted their solutions. Winners must post or link to their solutions with seven days of the final competition deadline. The competition deadline is the 20th nov. 2013 11pm Paris time. Team mergers are allowed but moderated. Mergers are disallowed within 7 days of the competition deadline. There is no maximum team size. The data for this challenge is copyrighted by Y. Bas of Biotope and H. Glotin of LSIS. Its usage is restricted to this challenge. Each run will be named by as : nips4b_bird2013_teamname_numberoftherun.csv (without space nor special char). It will be sent to nips4b@gmail.com with at least 5 lignes of description of the method, subject the name of your run. You'll receive shortly your score and an update of the other team scores, on 33% of the test set. The 66% left will be used for the official final ranking. A submission website shall open soon also.